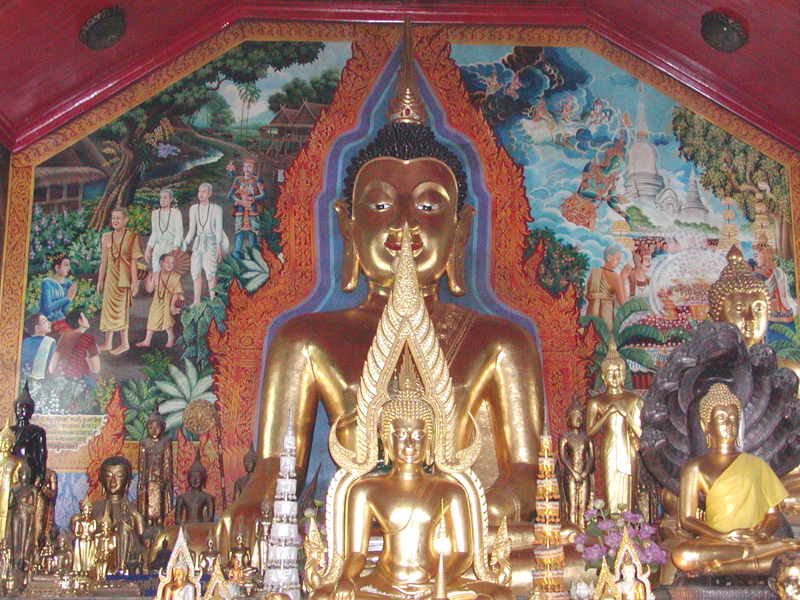 Ach came by early today and took Silvia, Uli and I to see Doi Suteep, a temple on a mountain just north of the city. We looked at the 330-some-odd stairs and started to climb! Actually, it wasn’t that bad. Regardless, getting to the top to see this complex is worth climbing twice as high! Of course, we had to pass the obligatory 10,000 trinket shops that clog the stairway about half way up. At the top you see a wonderful golden chedi and temple. Unfortunately, we were not able to see the city below as we were just above the cloud line. But I recall from previous trips that it is a terrific view! As we descended the temple complex, Ach’s phone rang. 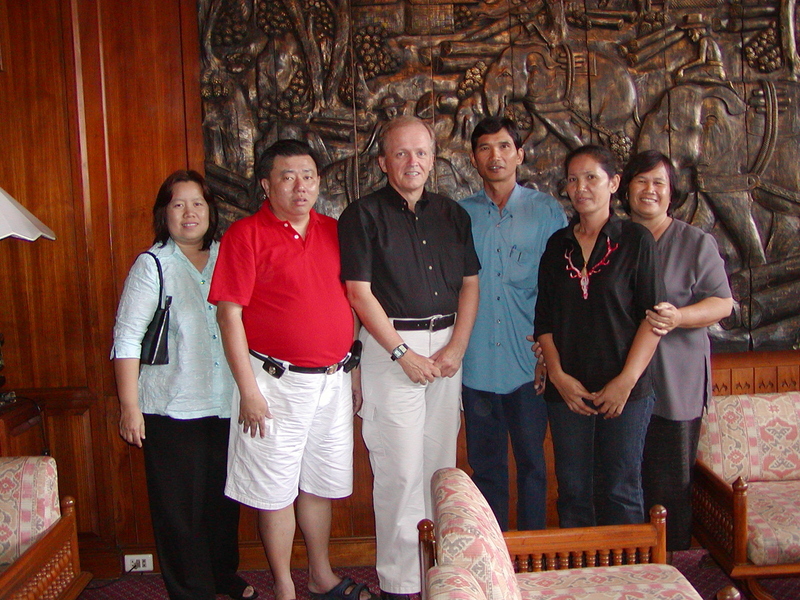 It was Aroon, one of my former students when I was in Peace corps in Bang Boh in Samutprakarn province. He is now a principal in one of the elementary schools in the town. In fact, many of the students I taught in Bang Boh still live in the area. He gave me the phone number of Samreung, the student who lived in my house for a year as his home was too far from the school to commute on a daily basis. 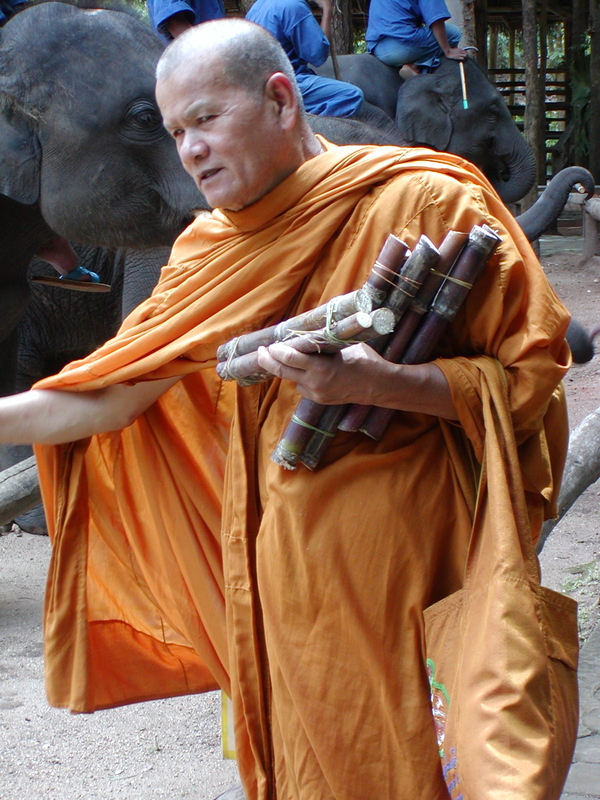 He is now living in the city of Lampang, just about 1 hour south of here! So I quickly called him and made plans to get together on Saturday. At the end of the day, Ach dropped us off at the hotel. We had a quick dinner and then headed to tackle and haggle with the merchants of the night bazaar. Always take the first price they give you, cut it in half and watch the fun begin! Today was an exhausting day. It reminded me of a typical Thai “tio” (sort of a long, wandering trip. In Thailand it is all about the journey, not the destination!) We covered about 600 kms in about 14 grueling hours! 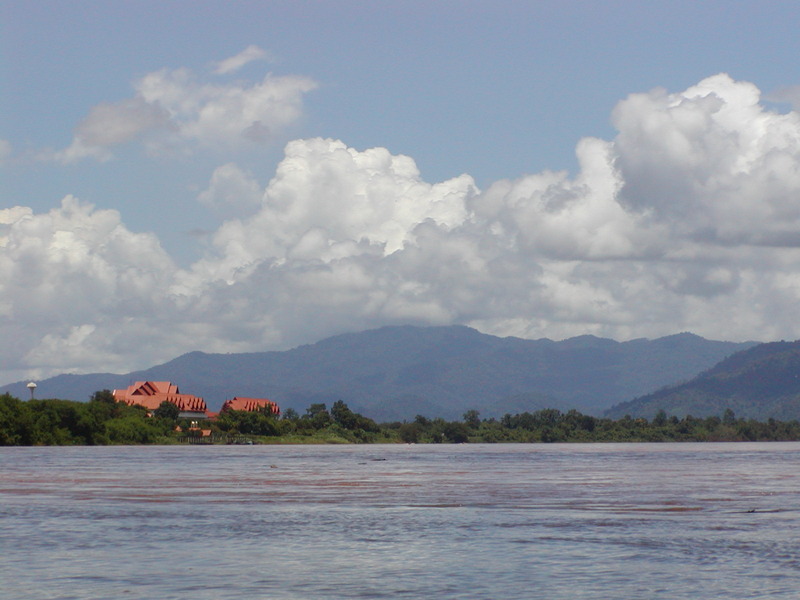 First, we went to Chieng Saen on the Mekong River. 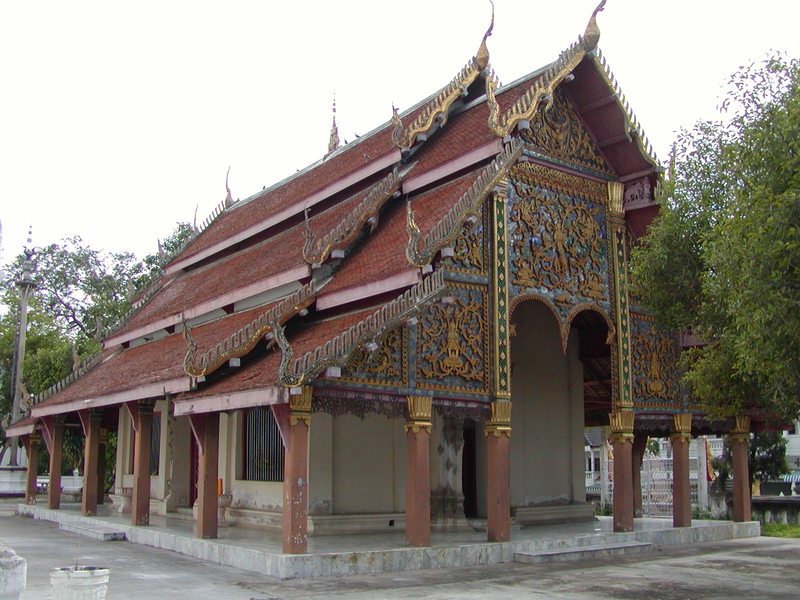 This was the entry point into what is now Thailand by the Thais about 900 years ago. 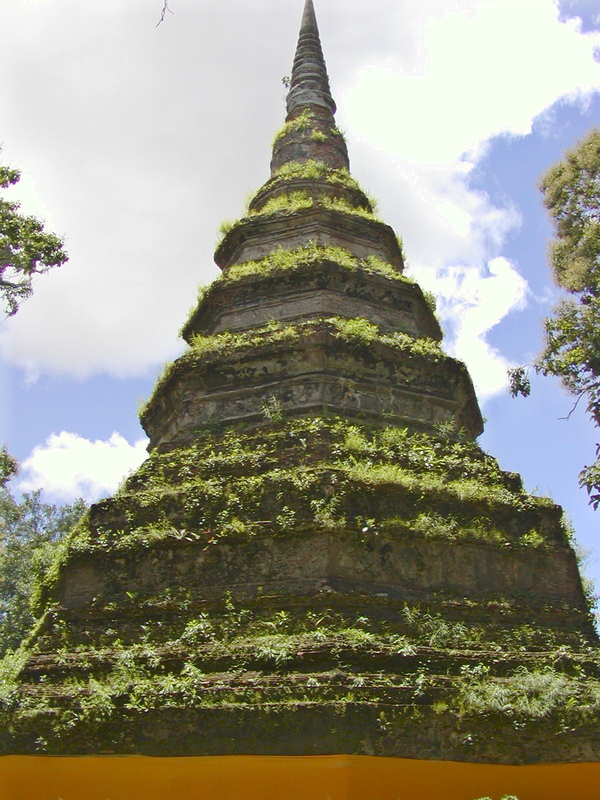 A chedi (stupa) still stands in this small town from that period. Well worth the 15 cents after a long trip! I want to live here someday! After lunch, we moved on to Mae Sai, a trading town on the Thai-Burmese border. It is amazing the amount of items for sale here– from gemstones real and fake, jewelry, jade, food of every kind, Burmese lacquerware (though not of the quality of the past), and wonderful bronze and brassware items. You will also encounter every kind of nationality and ethnic group the north has to offer! Hmong, Hmien, Lahu, Thai, Burmese, Karen, Akha, Chinese, you name it! 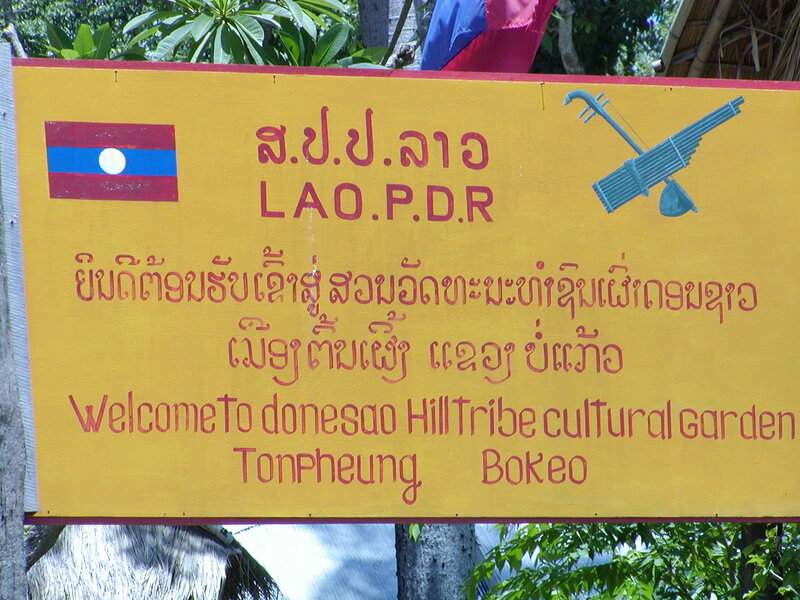 After an all-too-short dash around the town, we were off to Mai Ai, a village of hiltribe groups not far from Mae Sai. It was nice wandering in this rustic village. The town reminded me of the refugee camps I worked in so many years ago. We had to climb up and down the muddy pathways that crisscrossed the village. Our near falls were an amusement to the locals, much as they were to us, so fair enough! The fact is I was kind of revolted by the place as the people seemed to be on display. 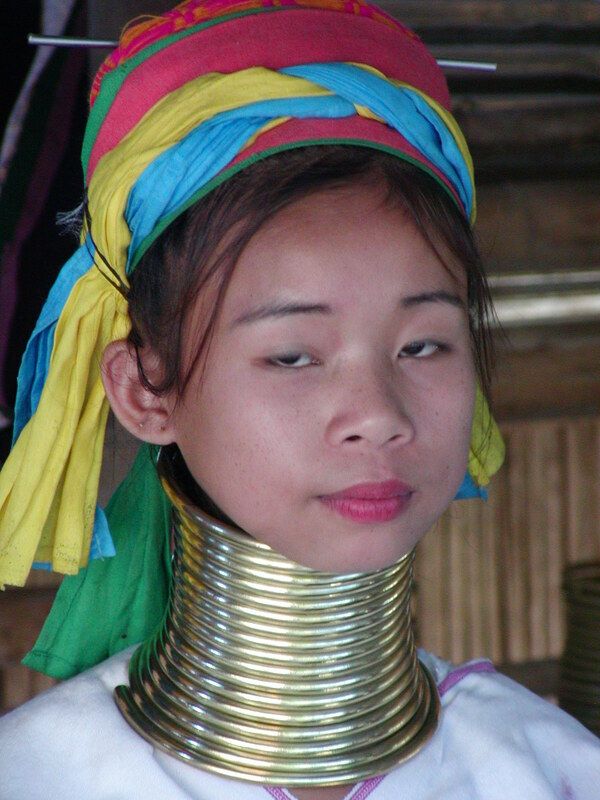 The most interesting people here are the long-neck Karen. The women have brass rings placed around their necks– up to 30 of them! to give the appearance of an elongated neck. This is a desirable sign of beauty in this culture. Contrary to popular belief, if the rings are removed, their necks won’t break. The heavy rings actually bear down on the shoulders, so they drop. We left as it was getting dark and we had a long return trip ahead of us. We then spent the next three terrifying hours being driven up and down mountain roads by a driver who seemed to enjoy tailgating and passing other vehicles on the curvy parts! We were verrrrrry happy to get back to Chieng Mai at 9PM… Went directly to bed after a quick meal in the night market! The centerpiece of the day was our trip to the elephant show north of the city. After a 30-minute exhibition of bathing, squirting water, standing on two legs, painting pictures, and playing soccer we were convinced that these had to be some of the smartest animals in the world! Not smart enough, unfortunately, to design a way to escape that place and head for the mountains! After the show, we took a one-hour elephant ride. It was pretty scary at first, but you soon get used to it. That is until the mahout decides to take the elephant, and you by extension, down the bank of the stream! YIKES! I thought I was going a– over head for sure! I learned that closing your eyes made it worse, but just keeping your eyes open and level to the ground helped a lot! 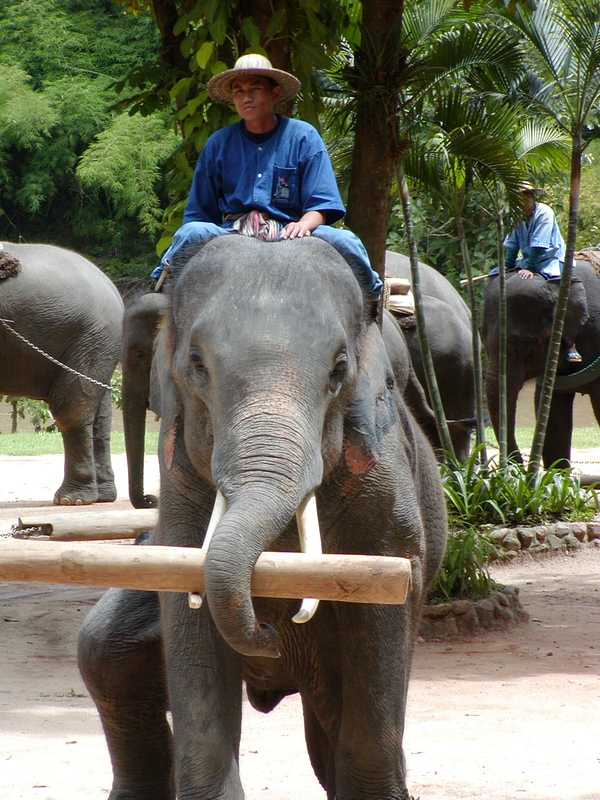 At one point, I asked the mahout to take my picture on the elephant. Down he dutifully went to oblige my request. Well, the elephant who had been eating leaves, decided that was the moment it needed a drink of water and lumbered off with me atop heading for the stream! The mahout managed to stop it before we reached the steep embankment again! By the end of the little ride, we were comfortable enough to encourage the mahouts to have a short race between Silvia and Uli’s and my elephants! What fun, but I think my liver is now located on top of my stomach! We got back just in time to get Silvia and Uli to the airport to return to Bangkok. What a time! Went to visit my old student, Samreung in Lampang. I quickly decided to stay overnight. He is still the responsible, level-headed guy he always was. Happy to see that he has an utterly charming wife and two grown boys in college. They live in her parents old house, open, airy and very “sabai.” (The closest word for this in English is “comfortable” but the meaning is much deeper.) Was fun taking a Thai-style shower again— cool water you draw from a large jar and pour on yourself, wonderful after a long, hot day! 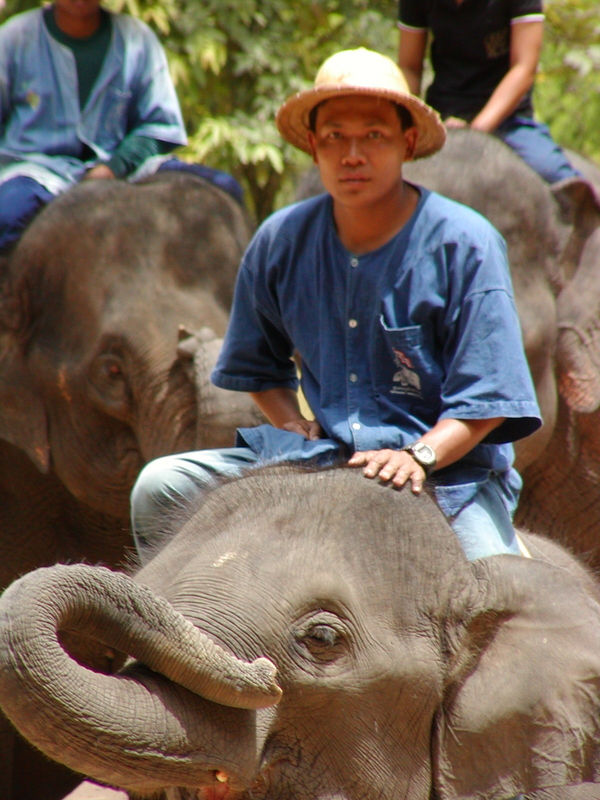 We visited the elephant training camp near here, but suffice it to say, I did not ride any of them! We also visited several temple complexes. 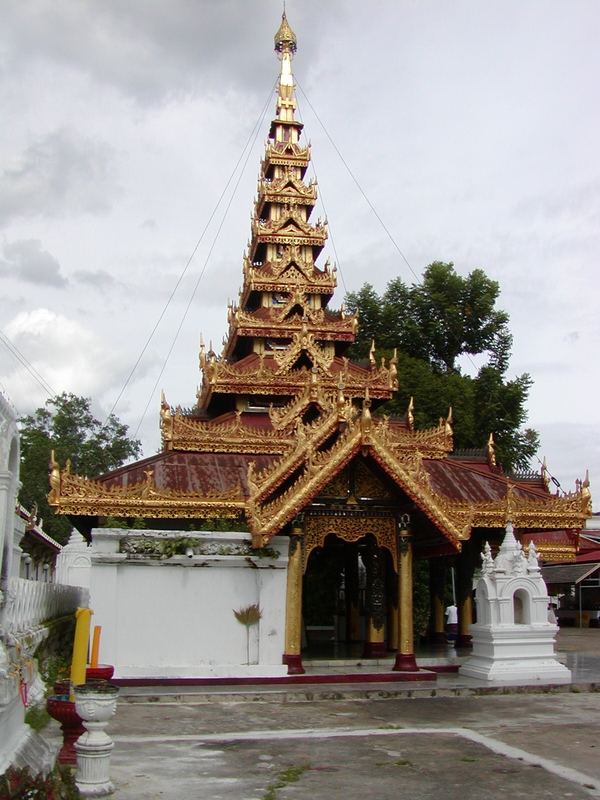 An interesting Burmese-style temple was my favorite. We ended up the day with Sam (the nickname I gave him years ago) taking me on a horse-drawn carriage ride around the old part of the city. We tried to find a few of the old haunts I frequented during Peace Corps training so many years ago. The Aroonsak Hotel is still there, where Charlie Howard and I sang Christmas caroles at the top of our lungs at 1AM because the stiffling heat would not let us sleep! 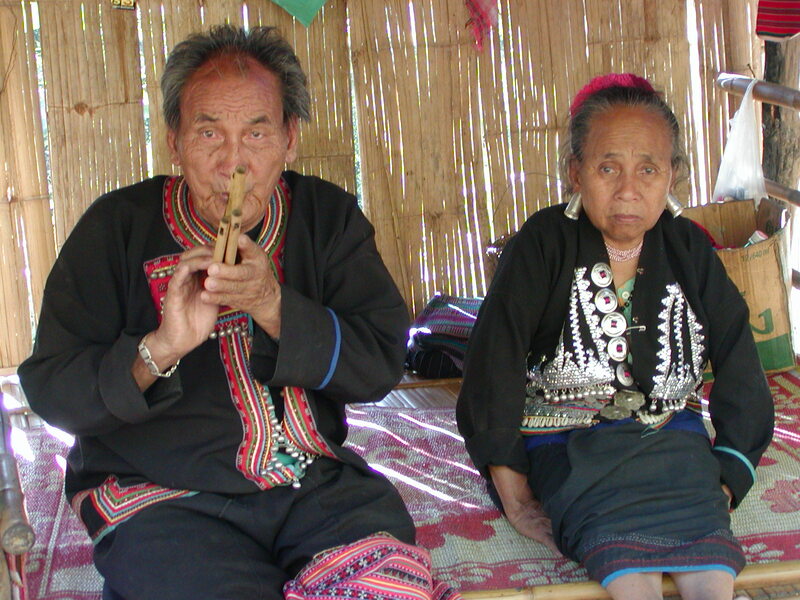 We then started inserting Thai words and situations into the music. I guess it showed that we were at least a little acculturated! I don’t know how we managed to not get kicked out that hotel that night! The restaurant that served hamburgers and fries near the hotel is gone. Enough was still intact that we could find the school where we did our training. Couldn’t find the old massive colonial house where I stayed with that wealthy banker and the servants to experience a “typical family live-in.” What a shame. I lived high back then! Partying with the governor and other local luminaries! Sam and I talked as comfortably as we had 26 years ago. Nice to see that he is happy and doing well. 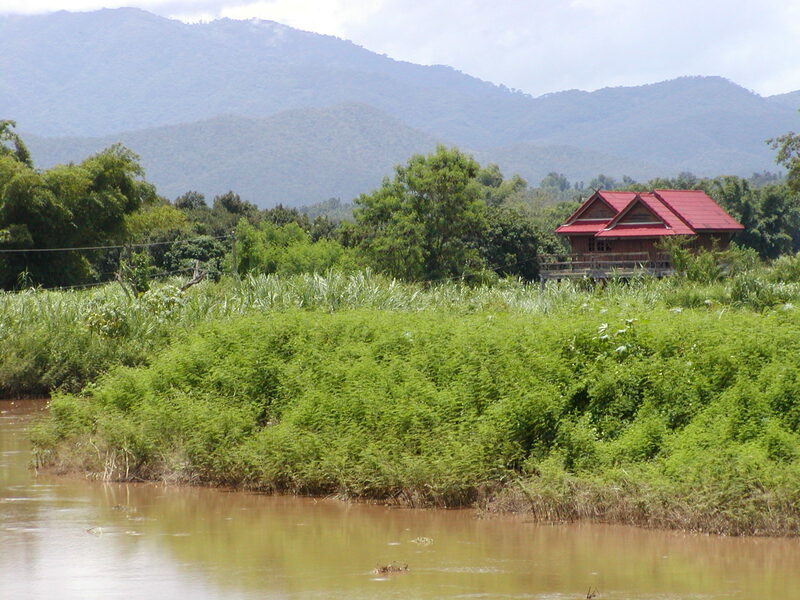 When they took me back to Chieng Mai the next day, it was difficult to keep a dry eye. He will always be like a little brother to me. Spend the afternoon with Ach and his family. We toured the Chieng Mai Museum, quite impressive I thought. Next, we went to the Saturday Market. I swear over 50% of the people there were not Thai! There are an unusual number of tourists here as many of them are afraid to go down south where the tsunami hit. Next stop is Bangkok and a visit to my old Peace Corps site on Tuesday. I had to reflect as the train left the station how wonderful it is to wake up in the morning and try to guess what you will see or learn that day. It is a feeling I had nearly every day over the seven years I lived here in the 1970’s. I hope I can hold on to that when I return to the States! This entry was posted in Uncategorized and tagged Buddhist art, Burma, Chiang Mai, Laos, Mekong, Thai, Thai language, Thailand. Bookmark the permalink.